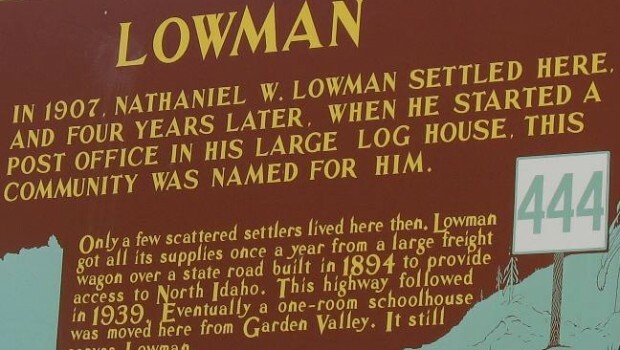 Lowman is a small unincorporated rural census-designated place in the western United States, located in Boise County, Idaho. Lowman is a small unincorporated rural community, located in Boise County, Idaho. It is nestled along the north bank of the South Fork of the Payette River in the central part of the state, at an elevation of 3,800 feet (1,160 m) above sea level. As of the 2010 census, its population was 42. The “Highway to Heaven” trail, stretching more than 150 miles (240 km) from Idaho’s capital of Boise, is the only mountain passage in the West that begins from a major city. The trail winds from 8th Street in Boise and climbs the Boise River, past the Lucky Peak Dam. Sagebrush gives way to gentle pine slopes leading to historic Idaho City, then over Mores Creek Summit at 6,117 ft (1,864 m) and switches back down to Lowman. The route then climbs with the South Fork of the Payette River up and over Banner Summit at 7,056 ft (2,151 m) to Stanley, where it meets State Highway 75 and the Sawtooths. 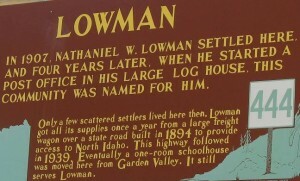 The community was named for a homesteader, Nathaniel Winfield Lowman, from Polk County, Iowa. He settled here 109 years ago in 1907, and when he started a post office four years later, it was named for him. Lowman is in a geothermally active region. Natural hot springs surface in the middle of the community as well as in many other places in the surrounding mountains. Visit the Lowman Ranger District and explore the Deadwood Reservoir or Bear Valley for camping and fishing fun. The scenic drive from Boise along the Wildlife Canyon Scenic Byway can be accessed at Banks along Idaho 55. The route offers many opportunities to view wildlife especially in the winter months. Temperatures in the summer on the District range into the upper 90s, and are generally dry. There are many recreation opportunities in the area ranging from roadside hot springs to backcountry travel and white water kayaking. Winter activities include a visit to the hot springs, snowshoeing, cross-country skiing and winter wildlife viewing.